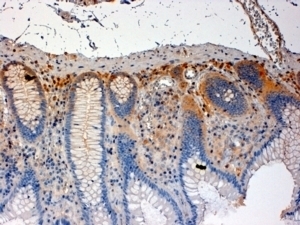 Goat anti Human CSK antibody recognizes an epitope within the C-terminal (CT) region of CSK, also known as c-src tyrosine kinase, Tyrosine-protein kinase CSK, p50CSK or Protein-tyrosine kinase CYL. CSK is a cytoplasmic tyrosine kinase ubiquitously expressed as two mRNA species (Partanen et al. 1991), which down-regulates the activity of the c-src oncoprotein (Chong et al. 2005). CSK is expressed in lung tissues and by macrophages and is highly conserved across species suggesting a role in important regulatory functions (Bräuninger et al. 1992). Antisera to human CSK (CT) were raised by repeated immunisations of goats with highly purified antigen. Purified IgG was prepared by affinity chromatography. Peptide sequence EQLEHIKTHELHL corresponding to the C-terminal region of CSK (NP_004374.1). TRIS/EDTA buffer pH 9.0 is recommended for this purpose. AHP733 detects a band of approximately 50kDa in Jurkat cell lysates.